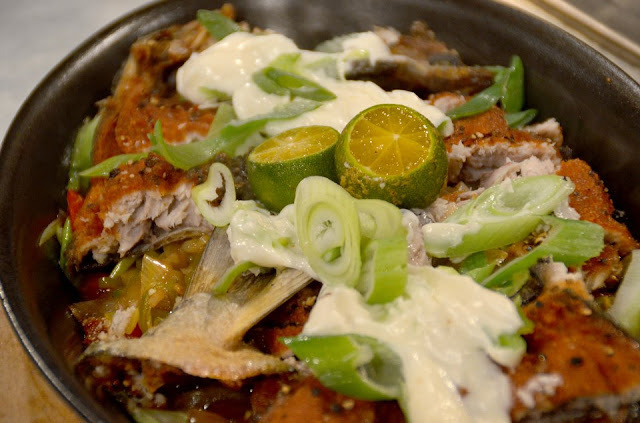 Sisig is originally made of pork. But just like adobo, it has evolved to many different variations such as fish and chicken. Next to pork sisig, I love bangus (milkfish) sisig. I’d say it’s the healthier version of the dish. 1. Sauté onion, garlic, chili, red and green bell peppers then add chunks of crispy fried bangus. 2. Add chicken stock, liquid seasoning, Worcestershire sauce and calamansi juice. 3. Turn off heat, toss bangus with Mayonnaise. 4. Pour in sizzling plate, garnish with julienne leeks, carrots and garnish with calamansi.